Here is an old Soviet video showing them in action. 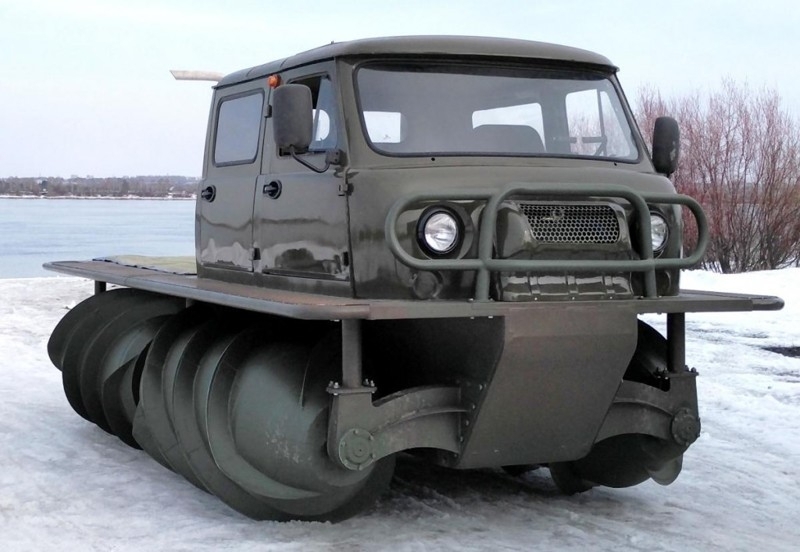 And this is new vehicle being produced in Russia now. 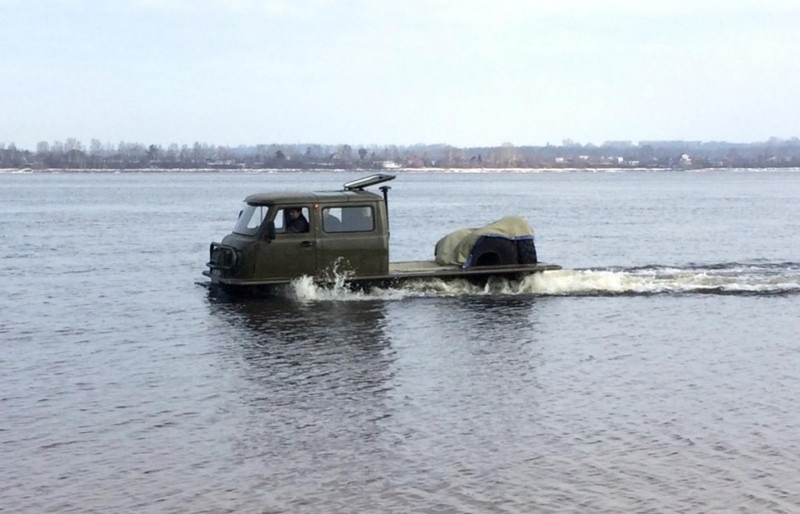 It goes as two and four door versions, also includes a pump inside the cabin to pump off the excess water when you move thru the river or like. It has CUMMINS ISF3.8 engine with 159 horse power. The price is not clear yet. Originally, this design was implemented by someone in the sixties in the flemish part of The Netherlands. He build such a wormdriven car/boat with 2 independent daf66 motors with variomatic transmission. He used it to work in the famous tyde-flooded part named “Land van Saeftinghe”. Because the two worms were driven independent and a variomatic transmission can run forward/backward @100% power, it could move forward/backward but also drive sideways. If it still exists, I do not know.. 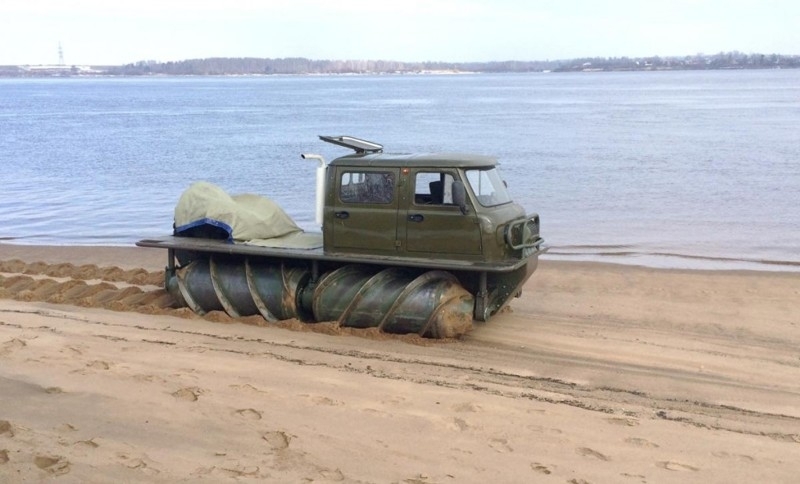 I would add a middle pontoon(or flat bottom boat) slightly higher up than the outer screws and make the carriage more like a dune buggy or sand rail sitting at a lower profile. For that matter, you could just make a screw drive that would attach to anything from cars,boats (especially a party barge), etc. Heck, add some skis for high speed water driving. It is neat just the way it is.